A ballet dancer who hid the leader of Peru's guerrilla insurgency above her dance studio has been sentenced to 20 years in prison. Abimael Guzman, founder of the Shining Path rebels, was discovered at Maritza Garrido Lecca's studio in Lima after a nationwide manhunt in 1992. A military court verdict in 1992 was overturned, prompting a retrial. The group is blamed for the majority of 70,000 deaths since Peru's insurgency broke out in the 1980s. Ms Garrido Lecca was arrested after a lengthy surveillance operation on her building in the Peruvian capital. Intelligence agents posing as rubbish collectors and street cleaners monitored her garbage for indications that Mr Guzman was hiding on the premises. Eventually they stormed the building, arresting both Mr Guzman and Ms Garrido Lecca. Prosecutors had sought a life sentence for the dancer, who denied being a leader of the Shining Path but did not deny links to the organisation. 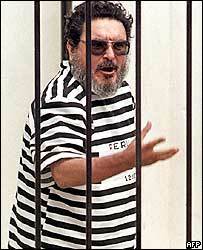 Mr Guzman is currently facing a retrial for his leadership of the leftist group. Ms Garrido Lecca, who has been imprisoned since her arrest in 1992, will serve another seven years to complete her 20 year sentence. She was also ordered to pay a fine of $18,000 (£10,230). She plans to appeal against the verdict, local media reported.